To examine the different roles of myeloid dendritic cells (M-DCs) and plasmacytoid dendritic cells (P-DCs) in the induction and regulation of immune response, we have studied chemokine secretion by freshly isolated DC subsets in response to bacterial, viral, and T cell-derived stimuli. M-DCs selectively produced very high levels of the homeostatic chemokines CC chemokine ligand (CCL)17 and CCL22, while P-DCs produced very little if any. In contrast, the proinflammatory chemokine CCL3 was secreted mostly by P-DCs, whereas CCL4 and CXC chemokine ligand 8 were produced by both subsets. The selective production of CCL17 and CCL22 by M-DCs but not P-DCs was confirmed in vivo by immunohistology on human reactive lymph node sections. The high production of CCR4 ligands by M-DCs suggests their capacity to selectively recruit at sites of inflammation T cells with regulatory properties or with a Th2 phenotype, whereas P-DCs, by preferentially secreting CCR1/CCR5 ligands, would mostly recruit effector T cells and, in particular, Th1-type cells. Dendritic cells (DCs),3 a highly specialized APC system critical for the initiation of CD4+ T cell responses are heterogeneous in terms of origin, morphology, phenotype, and function (1, 2). Two distinct DC subsets were originally defined in the human blood based on the expression of CD11c. More recent work has characterized these two subsets as belonging to the myeloid or lymphoid lineage and, although different denominations have been used, they can be defined as myeloid DCs (M-DCs) and plasmacytoid DCs (P-DCs) (3). A cell population resembling human P-DCs has also been identified in the mouse (4). M-DCs are characterized by a monocytic morphology, express myeloid markers like CD13 and CD33, the β2 integrin CD11c, the stimulatory receptor Ig-like transcript 1 and low levels of the IL-3R α-chain CD123 (5). Conversely, P-DCs have a morphology resembling plasma cells, are devoid of myeloid markers, express high levels of CD4, CD62 ligand (CD62L) and CD123 (6, 7). M-DCs produce high levels of IL-12 (8), while P-DCs produce high levels of IFN-α (7, 9). The proper localization of DCs in secondary lymphoid organs and their recruitment at sites of inflammation in response to chemotactic stimuli are critical for an optimal immune response. We have reported that, despite a similar expression and modulation of chemokine receptors, circulating P-DCs, in contrast to M-DCs, fail to migrate in response to inflammatory chemokines, while both subsets respond to lymph node homing chemokines following CD40 ligation (10). These different migration programs underscore the distinct lineage of these DC subsets and point to their divergent roles in the induction and regulation of the immune response. To further define functional properties of M-DCs and P-DCs able to shape immune responses, in the present study we have analyzed their chemokine production in response to bacterial, viral, and T cell-derived stimuli. The results indicate a selective production of homeostatic chemokines, like CC chemokine ligand (CCL)17 and CCL22, by blood M-DCs. In contrast, P-DCs show a preferential production of proinflammatory chemokines, such as CCL3, pointing to a differential capacity of these two DC subsets to recruit discrete leukocyte populations at sites of inflammation. PBMCs were isolated from buffy coats by Ficoll gradient (Pharmacia Biotec, Uppsala, Sweden) and peripheral blood M-DCs and P-DCs were magnetically sorted with blood DC Ag (BDCA)-1 and BDCA-4 cell isolation kits (Miltenyi Biotec, Bergisch Gladbach, Germany), respectively, as described (11), to a purity of 95–98% in both cases. Blood M-DCs and P-DCs (2 × 104 cells/well) were cultured as described (10) in medium containing 1000 U/ml recombinant human GM-CSF (Mielogen; Schering-Plough, Kenilworth, NJ) and 10 ng/ml IL-4 (BD PharMingen, San Diego, CA) or 20 ng/ml IL-3 (BD PharMingen), respectively. Cells were stimulated with 1 μg/ml LPS (Escherichia coli 0111:B4; Sigma-Aldrich, St. Louis, MO), 1:5000 Staphylococcus aureus Cowans I (Pansorbin cells; Calbiochem, San Diego, CA), CD154-transfected J558L cells at a ratio of 4:1, 6 μg/ml CpG oligonucleotide 2006 (MGW Biotech, Ebersberg, Germany), and 20 ng of hemagglutinin/ml inactivated influenza virus strain A/Moscow/10/99 (a kind gift from Dr. T. De Magistris, Istituto Superiore di Sanità, Rome, Italy). After 24–72 h of culture, supernatants were collected and chemokine concentrations were measured by sandwich ELISA using Abs from R&D Systems (Minneapolis, MN). Flow cytometric analysis was performed as previously described (12), in the presence of 100 μg/ml mouse IgG, using the mAbs anti-CD1c (BDCA-1) FITC or PE, and anti-BDCA-2 FITC or PE (Miltenyi Biotec). Cells were analyzed with a FACScan flow cytometer (BD Biosciences, Mountain View, CA) using CellQuest software. L1.2 cells transfected with human CCR4 were kindly provided by Dr. D. D’Ambrosio (BioXell, Milan, Italy). Chemotaxis assay was performed using 5-μm pore polyvinylpyrrolidone-free polycarbonate filters of 12-well transwell chambers (Corning Costar, Cambridge, MA). L1.2 hCCR4 cells were cultured for 16 h with 5 mM sodium butyrate, washed, and resuspended at a concentration of 1 × 106/ml in RPMI 1640 with 1% FCS. Supernatants from DC cultures or recombinant chemokines (0.6 ml) were added to the bottom chamber of the transwell and 0.1 ml of cell suspension was added to the top chamber. Transmigrated cells were recovered from the lower compartment of the transwell after a 3-h migration was performed at 37°C, and were quantified by trypan blue exclusion counting using light microscopy. CCL17 and CCL22 expression were evaluated on frozen sections from lymph nodes showing nonspecific reactive changes, using polyclonal goat anti-CCL17 Ab (Santa Cruz Biotechnology, Santa Cruz, CA) and a anti-CCL22 mAb kindly donated by Dr. P. Gray (ICOS, Bothell, WA). M-DCs and P-DCs were identified with anti-CD11c (BD Biosciences) and anti-CD123 (BD PharMingen), respectively. Immunohistochemistry was performed using the labeled streptavidin biotin system-HRP indirect immunoperoxidase technique (DAKO, Milan, Italy). Double immunofluorescence for CCL17 and CD11c was performed by applying anti-CCL17, followed by biotinylated rabbit anti-goat (Biogenex, San Ramon, CA) and Texas Red-conjugated streptavidin (Vector Laboratories, Burlingame, CA); after a 10-min incubation with normal goat serum, sections were treated with anti-CD11c and goat-anti-mouse IgG2b conjugated with FITC (Southern Biotechnology Associates, Birmingham, AL). Peripheral blood DCs from healthy donors were magnetically purified based on the expression of BDCA-4, followed by B cell depletion and selection of BCDA-1+ cells, as described (11). As shown in Fig. 1⇓, two discrete populations, both HLA-DR+ (data not shown) were obtained: expressing CD1c and negative for BDCA-2 expression (M-DCs), or expressing BDCA-2 (and BDCA-4, not shown) and negative for CD1c expression (P-DCs). Additional phenotypic analysis of the purified populations demonstrated that M-DCs were CD11c+, CD123low, CD62Llow, CD36low, and CD45 RAlow, whereas P-DCs were CD11c−, CD123high, CD62Lhigh, CD36high, and CD45 RAhigh (data not shown), confirming the subset assignment (7). Phenotype of enriched blood DC subsets. Phenotype of M-DCs and P-DCs purified with BDCA-1 and BDCA-4 isolation kits and stained for CD1c and BDCA-2 expression. Results are from a representative routine experiment. M-DCs and P-DCs express different sets of Toll-like receptors (TLR), able to recognize distinct pathogen-associated molecular patterns, and thus respond to different stimuli. M-DCs have been found to express preferentially TLR1, 2, 4, 5, and 8, whereas P-DCs demonstrate a strong and selective expression of TLR7 and 9 (13, 14, 15). Because TLR4 is required for the response to LPS and TLR9 for the response to CpG oligonucleotides, the two DC subsets were expected to respond selectively to these stimuli. This is indeed the case also for chemokine production: P-DCs fail to respond to LPS and M-DCs to CpG, using as read-out the secretion of six different chemokines (Fig. 2⇓). A striking result is the selective production by M-DCs of high levels of the homeostatic chemokines CCL22/monocyte-derived chemokine and CCL17/thymus and activation-regulated chemokine (TARC). A substantial level of these chemokines is produced constitutively by M-DCs, and it is strongly up-regulated by LPS and CD40 ligation. P-DCs fail to produce CCL17, either constitutively or following activation, after 24 h (Fig. 2⇓) and at different time points up to 72 h (not shown) of culture. P-DCs also fail to produce CCL22 constitutively at 24 h (Fig. 2⇓) and at any point tested up to 72 h (not shown) of culture, and secrete much lower levels than M-DCs after activation. Conversely, the proinflammatory chemokine CCL3/macrophage-inflammatory protein (MIP)-1α is mostly produced by P-DCs, whereas CCL4/MIP-1β and CXC chemokine ligand (CXCL)8/IL-8 were produced at similar levels by both subsets. 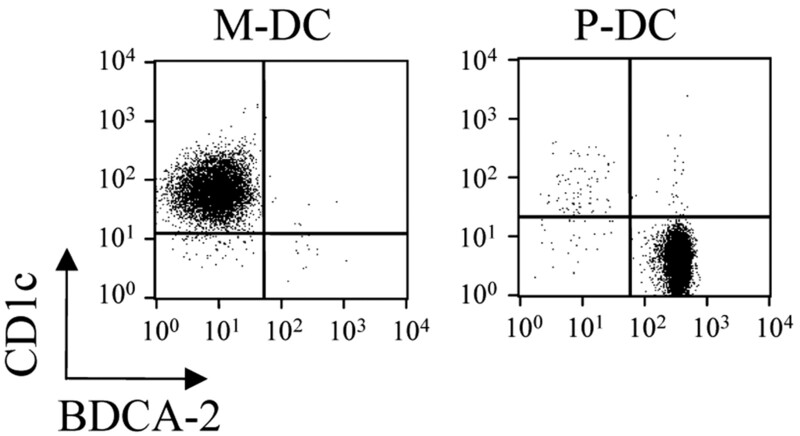 Neither P-DCs nor M-DCs produced CCL1/I-309, CCL2/monocyte chemoattractant protein-1, CCL5/RANTES, CCL18/pulmonary and activation-regulated chemokine, CCL19/MIP-3β, or CXCL12/stromal cell-derived factor-11, and only minimal levels of CXCL10/IFN-γ-inducible protein-10 were produced (Fig. 2⇓). CCL20/MIP-3α was also not produced under any condition tested (data not shown). To ascertain whether the high levels of CCL22 and CCL17 produced by M-DCs were functional, culture supernatants were tested for their capacity to induce the migration of CCR4-transfected cells. Results in Fig. 3⇓A demonstrate that CCR4-transfected cells migrate equally well in response to recombinant CCL22 and CCL17. Supernatants from cultures of M-DCs and P-DCs unstimulated or stimulated by CD40L-transfected cells showed constitutive production of CCL22 and CCL17 only by M-DCs, and this was further up-regulated by CD40 ligation (Fig. 3⇓B), in agreement with the data reported in Fig. 2⇓. The production pattern of CCR4 ligands was closely paralleled by migration of CCR4-transfected L1.2 cells (Fig. 3⇓C), indicating that the chemokines produced are indeed functional. CCL22 and CCL17 transcripts in blood M-DCs and P-DCs have been also examined by RT-PCR. Although this approach is not quantitative, mRNAs for both chemokines were detected in M-DCs but were negligible in P-DCs (data not shown). These results parallel protein determinations obtained by ELISA, chemotaxis, and immunohistochemistry. Chemokine production by DC subsets in response to different stimuli. Magnetically purified M-DCs and P-DCs (2 × 104 cells/well) were cultured for 24 h in GM-CSF/IL-4 or IL-3, respectively, in the presence of S. aureus Cowans I (SAC), LPS, CpG, 2006, inactivated influenza virus (virus), or CD40L-transfected J558 cells (CD40L). Mean and SE of secreted chemokines (nanograms per milliliter) detected by two-site ELISA from 4–11 experiments are indicated. CCL22 and CCL17 produced in vitro are functional. Magnetically purified M-DCs and P-DCs (2 × 104 cells/well) were cultured for 24 h in GM-CSF/IL-4 or IL-3, respectively, with medium alone or containing CD40L-transfected J558 cells (CD40L). A, Migration of CCR4-transfected L1.2 cells to the indicated concentrations of recombinant CCL22 and CCL17. B, Chemokine production (mean ± SE from triplicate cultures) in the culture supernatant of unstimulated or CD40L-stimulated M-DCs and P-DCs. C, Migration (mean ± SE from triplicate cultures) of CCR4-transfected L1.2 cells in response to culture supernatants (diluted 1/10) from M-DCs and P-DCs. The data are from one representative experiment of two performed. To confirm in vivo the selective production of CCL22 and CCL17 by M-DCs, their in situ production by reactive lymph node cells was examined by immunohistochemistry (Fig. 4⇓). M-DCs, corresponding to interdigitating reticulum cells, and P-DCs were identified on frozen section from reactive lymph nodes with anti-CD11c and anti-CD123 mAbs, respectively. On subserial sections, staining with anti-CCL22 and anti-CCL17 showed cytoplasmic expression of both molecules by M-DCs. Fig. 4⇓ also shows a cell strongly positive for CCL22 production and with dendritic morphology forming a rosette with nearby lymphocytes. Double immunofluorescence revealed CD11c+CCL17+ cells with dendritic morphology. In contrast, P-DCs were uniformly negative for expression of CCL22 and CCL17. The endothelium of a high endothelial venule expressed CCL17, as previously reported in skin endothelial cells (16). Therefore, CCL22 and CCL17 are selectively produced by M-DCs, but not by P-DCs, also in vivo. Selective production of CCL22 and CCL17 by M-DCs but not P-DCs in vivo. Frozen sections from a reactive lymph node stained with anti-CCL22, anti-CCL17, anti-CD123, and double immunofluorescence for CCL17 and CD11c. M-DCs strongly express CCL22 and CCL17, the latter is obviously located in the cytoplasm (red) of a M-DC labeled on the cell membrane (green) by CD11c (upper panels). Serial sections of a large aggregate of P-DCs identified by anti-CD123 show that these cells do not express CCL22 and CCL17 (lower panels). Focal reactivity for CCL17 is recognizable on the endothelium of a high endothelial venule (arrow). Original magnification, from upper left to bottom right: ×1100, ×250, ×1100, ×180, ×180, ×180. The present study demonstrates that chemokine production represents an additional level of diversity between human blood DC subsets. 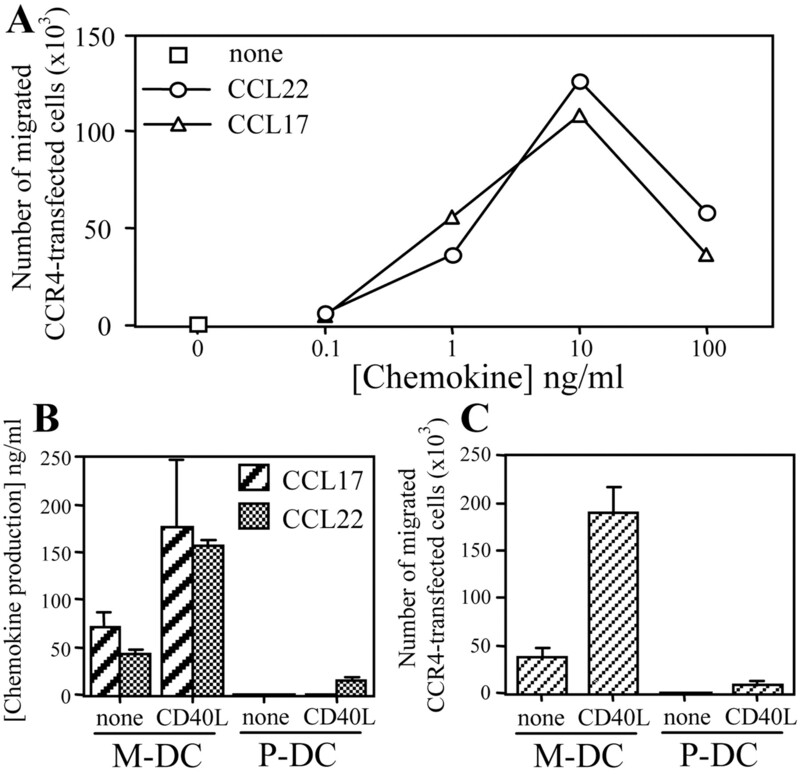 Production of the homeostatic chemokines CCL22 and CCL17 is a prerogative of M-DCs whereas P-DCs are quite efficient and selective producers of the inflammatory chemokine CCL3. The selective production of high levels of CCL22 by M-DCs is already apparent in unstimulated cells (over 1200 ng/106 cells/24 h) and is further enhanced (up to 6500 ng/106 cells/24 h) by bacterial and T cell-derived stimuli to levels much higher than those attained by monocyte-derived DCs (17). In contrast, much lower levels of CCL22 are produced by P-DCs. The production of CCL17 is even more strictly compartmentalized, with high levels produced by M-DCs and negligible ones by P-DCs. This strict compartmentalization is maintained also in DC subsets migrated to lymph nodes. Conversely, P-DCs, but not M-DCs produce relatively high levels of the proinflammatory chemokine CCL3 in response to bacterial, viral, and T cell-derived stimuli. The high production of CCR4 ligands by M-DCs suggests the capacity of this DC subset to selectively recruit at sites of inflammation T cells with a Th2 phenotype (18, 19) or CD4+CD25+ regulatory T cells (20, 21), whereas P-DCs, by preferentially secreting CCR1/CCR5 ligands, would mostly recruit effector T cells and, in particular, Th1-type cells (18, 22). However, P-DCs may also favor the induction of T cells with suppressive properties, as indicated by the generation of CD8+ regulatory T cells by CD40L-activated P-DCs (23). Mature M-DCs induce Th1 cell differentiation (8), but when immature they induce IL-10-producing CD4+ and CD8+ regulatory T cells (23, 24, 25). Our demonstration that blood and lymph node M-DCs produce chemokines able to recruit CD4+CD25+ T cells, as well as Th2 cells, indicates the capacity of this DC subset, unlike P-DCs, to attract T cells with regulatory properties. Interestingly, CCL22 produced by microglia has recently been proposed to regulate Th1-mediated inflammation of the CNS by facilitating the homing of Th2 and, possibly, regulatory T cells into the lesion site to counteract the inflammatory process (26). Several chemokines, including CCL1, CCL2, CCL5, CCL18, CCL19, CCL20, and CXCL12 were not produced by either DC subset in response to any stimulus tested. In particular, CCL18, a chemokine reported to be produced in a constitutive manner by monocyte-derived DCs (27), was not detectably secreted by either blood DC subset, in both unstimulated and stimulated conditions. These results differ from a previous study where CCL18 was detected in activated CD11c+ blood DCs (28), and suggest that different stages of differentiation and/or of activation may modulate CCL18 production in DC subsets. Also CCL1, a chemokine able to recruit Th2 (29) and T regulatory (20, 21) cells was not produced under any condition tested. Thus, similarly to what is observed in monocyte-derived DCs (17, 28), CCL17 and CCL22 are secreted in consistent levels by blood M-DCs and their production is strongly up-regulated following in vitro maturation. In contrast, neither circulating P-DCs nor P-DCs stimulated by CD40 ligation or by CpG secrete relevant levels of these two homeostatic chemokines. The migration behavior is also very different in the two cell types; circulating M-DCs migrate to several inflammatory chemokines in contrast to P-DCs responding only to the homeostatic chemokine CXCL12 (10). This would explain why P-DCs localize predominantly in secondary lymphoid organs, while M-DCs are rapidly recruited at sites of inflammation. In conclusion, P-DCs produce preferentially proinflammatory chemokines but respond selectively to homeostatic ones whereas the reverse is true for M-DCs, highlighting not only the different migratory properties of these DC subsets but also their capacity to recruit different cell types at inflammation sites, and indicating a complementarity in their functional activity also in this respect. We thank Silvana Festa for expert technical assistance with immunohistochemical stainings. ↵1 This work was supported in part by European Community Grants QLRT-1999-00276 (to S.S.) and QLRT-2000-02103 (to L.A.). ↵3 Abbreviations used in this paper: DC, dendritic cell; M-DC, myeloid DC; P-DC, plasmacytoid DC; L, ligand; CCL, CC chemokine ligand; rh, recombinant human; BDCA, blood DC Ag; TLR, Toll-like receptor; MIP, macrophage-inflammatory protein; CXCL, CXC chemokine ligand.